A family of women and girls, widowed, abandoned, and otherwise living as outcasts, struggle to exist in a bleak town in the Northwest mountains. Death by water plays a part, as well as migrancy, trains, family ties, subsistence, darkness, clutter, conformity, freedom, and more. If you meditate on the cover of this book, you’ll get a feel for one of the story’s central images. This is another monumental piece, larger than its parts, with writing that is brilliant and sublime. It is a close cousin, I think, to McCarthy’s Blood Meridian. Both novels create dark worlds, tragic storylines, and characters of biblical proportions. In depths that scholars can analyze for years. Both novels have astounding lyrical descriptions of landscape and sky. Both cut to the marrow of raw human existence. If there is a simple difference to point out here, it’s that Housekeeping is more accessible and not as savage; readers are more likely to stay with it. I wondered if I would stay during some slow sections in book middle. I was tested by the family of girls and their insistence on creating their own obstacles. But in the last sections, the pace picks up again once Sylvie makes the supreme mistake of catching the law’s attention. Fighting against the odds, her “housekeeping” compensations don’t make amends, and all that’s left is for her and Ruth to abandon the house. When they flee, a harrowing scene is described. One relating to the cover. It affected me as much as any Stephen King cellar scene. 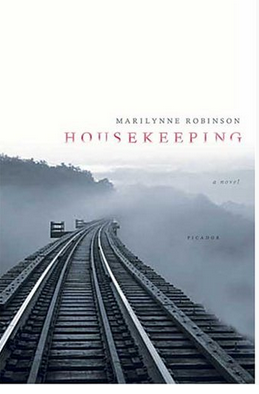 It’s just one example of the power of Marilynne Robinson’s writing. It may well send me to the store or library to check out her book Gilead. Posted in booknotes on November 7, 2012 by Wm P.